THE COLD WEATHER is going to continue over the next couple of days with temperatures set to hit -3 degrees tonight and tomorrow night. Today will be bright and sunny in most areas, but there will be scattered showers in coastal counties in the north and west with highs of eight degrees. Tonight will be a cold and wintry night with temperatures dropping to as low as -3 degrees. 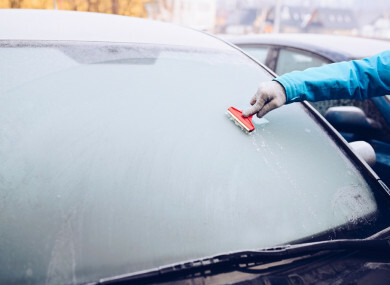 Motorists are being urged to take care as the freezing weather will bring with it frost and icy stretches on untreated surfaces, along with some fog. Tomorrow will be cold and bright with frost clearing throughout the morning, according to Met Éireann. Sunny spells are expected in the south and southeast but scattered showers of rain and hail will hit higher grounds. There will be northerly breezes and highs of five to eight degrees celsius. Friday will be a little less cold but cloudier with light rain locally. Light northwest breezes and temperatures of six to 10 degrees are forecast. Temperatures will remain between eight to 10 degrees throughout the weekend but frost is expected in the southeast where clear skies will result in a sharp frost. Email “Temperatures to continue to dip below freezing with widespread frost and icy patches”. Feedback on “Temperatures to continue to dip below freezing with widespread frost and icy patches”.